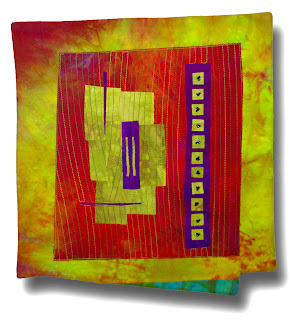 I recently sent in my quilt for the annual SAQA Donation Auction. This is SAQA's biggest fundraiser of the year. Many small, 12" x 12" works from a wonderful list of fiber artists (including a few from this group) will be available to don your walls come September. My donation, "Amidst the Fire" is below. You can see more pieces here. I can't wait for the frenzy in September to begin and the joy that comes from owning a small piece of art.